Ford never offered a Mustang station wagon. To solve this problem, different people and companies have created their own Mustang wagons with mixed success. 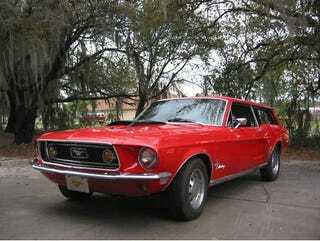 This Mustang wagon currently on Ebay is an example of one of the better conversions. The factory Ford Mustang wagon is a fabled creation. The story goes that in 1966 Italian coach builder Intermeccanica built a Mustang station wagon for advertiser Barney Clark and designer Bob Cumberford which showed up in many car magazines of the day. Supposedly Ford had a Mustang wagon in design stages around the same time but scrapped the program shortly after the Intermeccania cars appeared. The Intermeccania cars are often mistaken for a factory concept. This particular Mustang Wagon is not an Intermeccania car, but it is one of the nicest Mustang wagon conversions I've ever seen. The wagon was made from a narrowed and sectioned 1967 Ford Country Squire roof. The combination of the roof line and the hard top without the B pillar make this Mustang wagon look like it came from the factory a long roof. With less than a day left on the Ebay auction the reserve has not been met despite bidding in the $10,000 range. Although it looks like it needs a few things here and there, this Mustang wagon would be a great way to own a 60s Mustang that sticks out in a crowd.